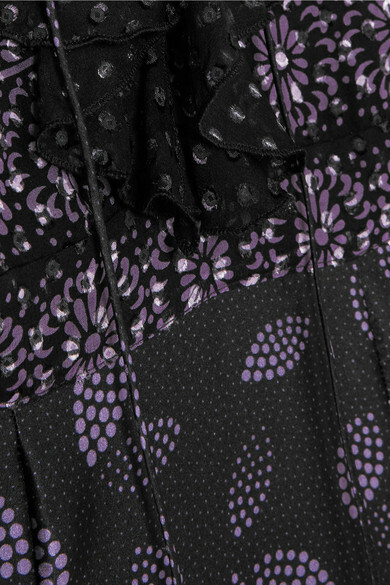 Inspired by the joy of getting dressed up, Anna Sui's Fall '18 collection encapsulates everything she loves about fashion. This bohemian maxi dress has a fil coupé silk-blend chiffon bodice detailed with a lace-up front, ruffles and sheer sleeves, and a printed silk-satin skirt that just skims your calves. Wear it with boots and stacks of chunky gold jewelry. Shown here with: Chloé Bucket bag, Isabel Marant Knee boots, Chloé Belt, Alexander McQueen Ring, Bottega Veneta Ring.